All people are living their own unique narratives with themselves as the sole protagonists. Each of these parallel narratives exists in the same moment and is constantly coinciding with and interacting with those of others. Every conversation is an intersection of narratives and, the better they coincide, the better the interactions will be. In his newest film, “The Meyerowitz Stories (New and Selected),” director Noah Baumbach explores how family members’ own respective narratives coincide and depart through the lives of the Meyerowitz family. The patriarch, Harold Meyerowitz (Dustin Hoffman, “Rain Man”), is a blunt, self-absorbed sculptor who approached semi-celebrity at one point in his career. While the quality and impact of Harold’s work is never clear — though Harold himself staunchly maintains that he has not lost his edge — Baumbach makes it clear that Harold consistently neglected his duties as a nurturing father to his three children: Danny, Jean and Matthew. The story starts with Harold’s eldest son, Danny, played perfectly by Adam Sandler (“Punch Drunk Love”). Yelling his way through New York City’s gridlock, he visits his father on the way to drop off his daughter, Eliza (Grace Van Patten, “Tramps”), for her first year of film school. Danny, in some ways the film’s protagonist, is the disappointment of the family, according to how Harold treats him. Brazen as ever, Hoffman’s Harold essentially ignores his son, heaping praise onto the younger Matthew, even when Danny is the only person who still slavishly maintains that Harold’s artistry is valuable to the world. Unlike his brother Matthew (Ben Stiller, “Zoolander”), who has achieved wealth as a business manager, Danny is a former pianist turned homemaker turned divorcee and finds himself truly alone as his daughter leaves him for college. Adam Sandler truly shines in this tragicomic role as all of the awkwardness and anger that characterizes his usual characters is leveraged to create a poignant person who truly wants to be loved and needed. While also dealing with Harold’s neglect, Jean laments that, as the only unartistic member of the family, she is constantly forgotten by her father. Still, out of a sense of forgiveness and familial duty that both her brothers lack, she tends to and supports her curmudgeonly father. Before long, Matthew enters the story as well, and audiences soon learn that, though his father dotes upon him, all is not well for Matthew. Where his siblings long for attention and respect from their father, Matthew longs to be rid of the corrosive expectations that Harold has placed upon Matthew as his favored son. The first half of the film weaves the characters’ narratives together, often hilariously, as their quirks, expectations and baggage clash ever so slightly. Each character is slightly out of sync with the others, and characters never converse. They simply talk past each other. Baumbach has written a sharp, incisive script that peels back the veneer of Harold Meyerowitz’s semi-famous, outwardly successful family to reveal how each member is resting atop a mountain of unfulfilled, festering expectations. While this film could easily turn into another dysfunctional family movie in the vein of “The Royal Tenenbaums,” it mostly avoids cliches and reaches out to audiences through the strength of its performances. The cast plays off each other quickly and naturally, replicating a family dynamic familiar to most viewers. The performances ultimately are so powerful because of their emotional depth. 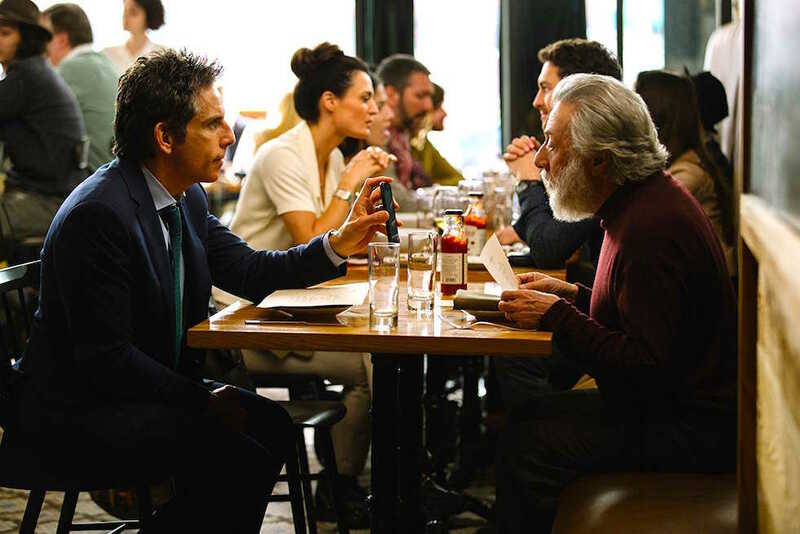 Stiller, Sandler and Marvel all wear their characters’ burdens and insecurities so well that when their narratives clash violently, viewers are as torn as the characters are. Halfway through the film, Harold is hospitalized and placed in a medically-induced coma. Here, Baumbach reveals the warm heart of the film. For all the bickering, disappointment and self-loathing that the characters carry with them, the Meyerowitzes are still a family. In several comically endearing scenes, viewers are treated to the three siblings simultaneously pestering, cross-checking and annotating the words of Harold’s doctors and nurses to ensure him the best treatment. Near the end of the film, each character wonders if Harold even deserves it. Baumbach posits that he does and that they all do. None of them will ever fulfill their expectations of themselves and each other, but that is okay. The disconnects in their narratives are superficial, self-imposed and ultimately inconsequential. Overall, Baumbach is able to weave this story together naturally, sidestepping cliches and delivering strong emotional climaxes in a plain and unadorned style. However, the movie does trip up occasionally. Some dialogue is clumsy, and some of the editing is questionable. There are several cuts that look truly out of place, like a series of jump cuts near the film’s end that will immediately take most viewers out of the film and interrupt the flow. Baumbach’s repertoire. After all, the concept of the dysfunctional family is certainly not a completely original premise for a film. In the pantheon of dysfunctional family movies, like “Little Miss Sunshine” and “American Beauty,” “The Meyerowitz Stories” certainly edges its way to the top, but it fails to distinguish itself enough to be incredible.